Colville enlisted in the Canadian Infantry in 1942. 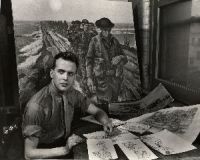 In 1944 he was appointed an official war artist and painted in England, France, Holland and Germany. He was one of three Canadian artists who visited Belsen concentration camp after its 1945 liberation. Today, Colville is celebrated for his magic-realist art.